Periodontal Dressing as an Adjunct after Scaling and Root Planing - A Useful Preventive Tool? Purpose: To determine the preventive effect of a periodontal dressing containing colophony, zinc oxide and magnesium oxide applied after scaling and root planing on clinical variables, subgingival bacteria and local immune response in patients with chronic periodontitis. Materials and Methods: In this randomised prospective clinical study, 28 volunteers with generalised moderate chronic periodontitis were treated with full-mouth scaling in a split-mouth design. In the test quadrants, the periodontal dressing was applied during the first three days. At baseline and after 6 and 12 weeks, probing pocket depth (PD), attachment level (AL) and bleeding on probing (BOP) were recorded, and subgingival plaque samples were taken for laboratory analysis. Results: In both groups, PD, AL and BOP were significantly reduced (p = 0.001). BOP was significantly lower in the control than the test group after 6 weeks (p = 0.046). Significantly reduced bacterial counts of Porphyromonas gingivalis were found in the control group after 12 weeks (p = 0.013). No differences were found for the microbiological results between the groups. After 12 weeks, interleukin (IL)-8 and matrix metalloproteinase (MMP)-8 were significantly higher in the test group (p = 0.023 and p = 0.003, respectively). Conclusion: The adjunctive application of a periodontal dressing had no additional preventive effect on clinical data 12 weeks after scaling and root planing. Purpose: To assess the oral health-related quality of life of the Israeli elderly. Materials and Methods: Data were collected from a subsample of those interviewed for the cross-sectional Mabat Zahav National Health and Nutrition Survey of the Elderly, carried out in 2005 and 2006 by the Ministry of Health in Israel. In-person interviews were conducted in the interviewees' homes using a structured questionnaire which included 7 questions on subjective dental health status and the 14 questions of the Oral Health Impact Profile 14 (OHIP- 14). Statistical significance of continuous variables was assessed with the Student t-test; categorical variables with normal distribution were analysed using the chi-square test and those with non-normal distribution with the Wilcoxon Mann-Whitney two-sample test. Results: 828 Jews and 159 Arabs from the total survey population of 1852 elderly (1536 Jews and 316 Arabs) completed the OHIP-14 questionnaire. An impact of oral health on the quality of life was reported by 16.6% of the respondents, 19.2% of females and 13.9% of males (p < 0.05). There were statistically significant differences in impact prevalence by gender, place of birth and economic status. No such differences were found by age group, population group or education. Significant statistical correlation was found between subjective assessment of general and dental health and OHIP impact prevalence, with poorer assessment correlated with increased prevalence of impact. Conclusions: The quality of life of 17% of Israeli elderly is affected by oral health. The OHIP-14 findings emphasise the importance of including basic dental treatment (treatment of dental pain and infections) in the range of services covered by the National Health Insurance Law. Chin, Zhe W. / Chong, Wai S. / Mani, Shani A. Purpose: To assess the knowledge, attitude and utilisation regarding fissure sealants (FS) and preventive resin restorations (PRR) among Malaysian dentists. Materials and Methods: A questionnaire consisting of 35 questions was distributed by mail or an online survey to 425 registered dentists selected according to place of work by stratified random sampling. Results: One hundred fifty-three dentists responded to the survey. A positive attitude towards FS and PRR was noted among most Malaysian dentists. About half of the respondents used FS/PRR occasionally (48.4%), while few (13.7%) applied them routinely. The majority of the dentists agreed that minimally invasive dentistry is important and FS are effective in caries prevention, using them on high caries-risk individuals. Most of the dentists used pumice or paste to clean teeth before placing FS/PRR. A significant number of dentists used a bonding agent prior to placing FS. Although only 57.5% dentists were aware of guidelines for FS use, most dentists agreed that guidelines are important. Conclusion: Although there was a positive attitude towards FS/PRR, few dentists applied them routinely. Some of the steps undertaken for placement of FS and PRR were outdated. Updating local guidelines for dentists to ensure uniform practice of FS and PRR is justified. Purpose: The oral cavity is a rich ecosystem with a plethora of microorganisms, and different components of fixed orthodontic appliances may contribute to a shift in the balance of oral ecology. The purpose of this study was to investigate the antimicrobial potential of hexane and ethanol extracts of Salvadora persica on a monospecies biofilm model established on orthodontic brackets in vitro. Materials and Methods: Streptococcus mutans biofilm was formed on mini diamond orthodontic brackets following three days of anaerobic incubation at 37˚C. The bacterial cell viability of this biofilm was measured after their exposure to saline, hexane extract of S. persica, ethanol extract of S. persica and 0.2% chlorhexidine using 3-(4, 5-dimethylthiazol- 2-yl)-5-(3-carboxymethoxyphenyl)-2-(4-sulphophenyl)-2H-tetrazolium (MTS) assay. On half of the brackets, the colony forming units (CFU) were counted. Both experiments were performed in triplicate. Results: The absorbance values obtained from the MTS reduction assay after exposure to the different test agents showed a decline in the bacterial cell viability of the S. mutans biofilm as follows: chlorhexidine (+) < hexane extract (S. persica, 5 mg/ml) < ethanol extract (S. persica, 5 mg/ml) < saline + 2% DMSO (-). There was significant difference between saline + 2% DMSO and the other test solutions (p < 0.05). The mean absorbance values showed that the antimicrobial activity of hexane extract was slightly more effective than that of the ethanol extract and was nearly as effective as chlorhexidine (+). However, the differences in the absorbance values between the extracts of S. persica and chlorhexidine (+) were not statistically significant (p > 0.05). The CFU counts of S. mutans obtained from chlorhexidine exposure were lower than from hexane and ethanol extracts. Conclusion: S. persica extracts were found to have antimicrobial effects on S. mutans biofilm established in vitro on orthodontic brackets suggestive of its potential use as an oral antimicrobial agent for orthodontic patients. Al Habashneh, Rola / Khassawneh, Basheer / Khader, Yousef S. / Abu-Jamous, Yousef / Kowolik, Michael J. Purpose: To determine the association between periodontitis and a high risk for obstructive sleep apnea (HR-OSA). Materials and Methods: A sample of 296 males with a mean (± SD) age 40 (8.5) years was selected. Subjects who scored positive in two or more categories of the Berlin questionnaire were considered as having HR-OSA. Results: Based on the self-reported symptoms of obstructive sleep apnea, 15% of patients were considered as HROSA. Patients with HR-OSA showed higher probing pocket depth (PPD) and clinical attachment level (CAL) compared with those with low risk for obstructive sleep apnea (LR-OSA) - 2.35 ± 0.69 vs 1.97 ± 0.34 (p = 0.000) and 2.95 ± 0.82 vs 2.12 ± 0.55 (p = 0.000), respectively. Patients with HR-OSA were more likely to have periodontitis (OR = 2.3; 95% CI: 1.03/5.10) compared to patients with LR-OSA. The prevalence of periodontitis varied significantly only among patients according to their response to category 1 (37% responded positively and 20% responded negatively, p = 0.003). When the OSA variable was replaced by the individual categories (1, 2 and 3), patients with a positive category 1 (OR = 2.27; 95% CI: 11.14/4.45) were more likely to have periodontitis than were patients with a negative response. Conclusion: The risk of finding periodontitis in HR-OSA patients was approximately double that of LR-OSA patients. Habitual snoring was also associated with increased risk for periodontitis. Purpose: Patients might refuse the offer of local anaesthesia (LA) administration prior to dental treatment. This study investigates subjective discomfort perception during non-surgical mechanical periodontal therapy delivered with or without LA. Materials and Methods: Sixty patients with mild to moderate chronic periodontitis and prior periodontal debridement experience were randomly enrolled in nonsurgical therapy of a quadrant with or without LA administration. Patients were free to comply or not with the allocated LA arrangement. Visual analogue scales (VAS) of discomfort perception at various stages of the treatment as well as overall satisfaction were recorded. Demographic, psychosocial and periodontal parameters were recorded. Results: Thirty-one patients undergoing nonsurgical periodontal therapy not receiving (LA-) and 29 participants receiving LA (LA+) were studied. Compared to LA- patients, LA+ individuals perceived less discomfort during treatment and reported less dental anxiety (p < 0.05). Lower overall treatment satisfaction was associated with prior unpleasant periodontal experience (p = 0.047). Overall, debridement discomfort was associated with not receiving LA, noncompliance with the pain control regimen allocated, longer treatment duration, greater gingival inflammation and a higher percentage sites with probing pocket depths ≥ 5 mm (p < 0.05). Conclusion: Clinicians should be aware that patients who refuse LA can experience higher dental anxiety and therefore may require various pain control strategies for comfort during nonsurgical periodontal therapy, which, if not employed, can lead to less periodontal treatment satisfaction. Can the Application of Fluoride Iontophoresis Improve Remineralisation of Early Caries Lesions? Purpose: To determine the optimal electric current intensity of fluoride iontophoresis (FI) for remineralisation of early caries lesions in vitro. Materials and Methods: Sixty specimens were made from bovine incisors and immersed in a demineralising gel for 96 h. Specimens were divided into control (conventional fluoride application) and experimental (FI) groups. All of the specimens were covered with fluoride for 4 min every day. Different electric current intensities (100, 200, 300 and 400 μA) were applied in the FI groups using the FI device. The concentration of KOH-soluble fluoride was determined to evaluate the amount of CaF2 formed on the tooth surface. The reduction in lesion depth was measured by polarised light microscopy. Results: The concentration of KOH-soluble fluoride was the highest in the specimens of the 300 μA FI group. However, there was no significant difference in the reduction of lesion depth between the experimental groups and the control group. Conclusion: Variations in the electric current intensity influenced the amount of CaF2 formed on the enamel surface, with the greatest amount found for 300 μA. Purpose: This study was designed to evaluate the dental status of adolescents initially presenting at Kuwait University Dental Clinic (KUDC). The purpose of this cross-sectional study was to evaluate (a) the prevalence of unrestored caries dentin among 12- to 16-year-old Kuwaiti residents, (b) the frequency of restorations extending into the inner half of the dentin, and (c) tooth loss pattern among this age group. Materials and Methods: Twelve- to 16-year-old patients who attended KUDC during the period January 2009 to December 2012 were included in this study. The total number of patients included in the study was 486; however, only 409 panoramic radiographs were available for evaluation. The Student t-test and one-way ANOVA were used for statistical analysis. Results: The prevalence of unrestored dentin caries among 12- to 16-year-old patients was 52%. The frequency of deep restorations extending into the inner half of the dentin was 33%. Tooth loss was found in 8.0% of the sampled population. The most common missing tooth was the mandibular first molar followed by the mandibular second premolar and the maxillary first molar. There were no statistical differences between Kuwaiti and non-Kuwaiti residents regardless of gender; however, males had a slightly higher DMFT. The DMFT and DMFS values in this study were higher than in other studies. 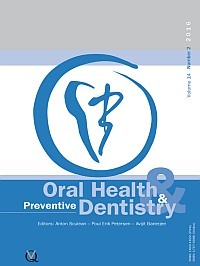 Conclusion: Despite the tremendous effort by the Kuwaiti government to improve oral health, comprehensive preventive strategies, dental treatment and maintenance of oral health are still necessary and must be reinforced in this age group.